Boulder, Colorado is rightly considered throughout America to be a model for instituting facilities and programs that create sustainable transportation choices that promote equity and quality of life. However, it is important to recognize that Boulder is far from being able to “rest on its laurels,” as too many in Boulder seem ready to do. Even in Boulder, there are a large number of transportation reforms that are essential if Boulder is to have a chance to achieve important transportation and quality of life objectives. Reduce SOV and other gasoline-powered transportation. Increase the proportion of bicycle, pedestrian and transit trips. Increase the amount of affordable housing. Promote compact, walkable urban design in town centers. Increase the proportion of transportation revenue that is user fee based. Promote slower and attentive car traffic. Promote quality of life via more healthy residential and commercial areas. This paper offers my suggestions for needed reforms to effectively achieve these objectives. In general, to be transformative (and to avoid needing to increase needed transportation funding), recognize that it is not about providing new transit, bicycle and pedestrian facilities. It is about taking away space and subsidies and speed for the car, by shrinking size of roads and parking, and increasing the cost of driving. It is essential to recognize the negative feedback loop of the travel time budget, the triple convergence, and induced trips. For example, designing streets to speed car travel results in increased community dispersal because travelers have an internal “travel time budget” that compels them to allocate travel time to their daily routine. If car speeds increase due to enabling street design, commuters respond by living further away from their destinations, because higher speed streets enable them to remain within their travel time budget. The “triple convergence” informs us that whenever we widen a road, we inevitably induce three motorist behavior changes that result in a quick return to congested road conditions: Motorists drive more often at rush hour, they drive more often by car, and they drive more often on the newly-widened street. The widening of a road (or intersection) thereby “induces” new car trips that would have never occurred had Boulder not spent large sums of public dollars to widen a road or intersection. Even in Boulder, the vast majority of citizens find that car travel is the most rational way to drive. As an aside, this is why adding new bike lanes, more frequent bus service, or adding new sidewalks are generally not effective in significantly reducing car use. In Boulder, the following factors make car travel quite rational. Comfort (temperature control, protection from weather, music, comfy seat, etc.). Ability to carry lots of passengers. Ability to travel long distances — particularly at times of your choosing, rather than based on a bus schedule. Free parking for nearly all of your trips. Boulder needs to strive to make bicycling, walking, and transit use more advantageous than car travel, and addressing the above factors (so that car travel is less advantageous in these categories) is an important way to start doing that. Boulder’s transportation staff is well-educated about the following recommended reforms. Their infrequent instances of suggesting such reforms is therefore not due to their being unaware of such tactics. Staff would make such recommendations regularly if or when their supervisors and elected officials gave them PERMISSION to make such recommendations. Eliminate any code barriers to infilling on off-street parking lots. Off-street parking is an extremely inefficient way to use the extremely costly land in Boulder – particularly in the town center, where no off-street parking should be allowed at all. Eliminate minimum parking requirements and consider converting them to maximum parking requirements (particularly in the town center). In addition to converting minimum parking to maximum parking, allow increased shared parking, require the unbundling of the price of housing from the price of the associated parking, and offer employees a parking cash-out option. Regulations currently require too much off-street parking. Only allow Inverted-U bike parking (or minor variations), and specify required spacing as well as required height. Regulations currently allow highly undesirable bike parking designs. The inverted-U design is about the only acceptable bike parking design. We don’t allow several car parking designs. Why do we allow it for bike parking? Hire a Shoup-based parking consultant to conduct a parking study for Boulder. Boulder should conduct an on-going inventory of how many regional commuters park in a free parking space. This can inform the City about how aggressively to push for parking cash-out, and whether the region will be able to shift regional commuters to transit (too much free parking for such commuters makes such a shift highly unlikely). Off-street parking should not be allowed to front streets – particularly in the town center. Exceptions should be only allowed on wide, high-speed streets, where conditions are too inhospitable to abut the street with a building entrance. Parking in Boulder should be more comprehensively priced (market-based pricing). The price of free parking should be unbundled from the price of housing so that those with fewer or no need for car parking can have more affordable housing (and reduce the incentive for owning cars). Reports providing details about unbundling the price of parking can be found here, here, and here. Each year, the total percentage of total free, off-street parking converted to priced parking shall be increased. Incentivize infill construction on off-street parking lots by, for example, exempting the property from FAR or density limits, and reforming property taxation. Conduct an inventory of on-street and off-street parking in the Boulder town center on an annual basis. Each year, the amount of town center off-street parking shall be reduced to a quantity lower than the prior year. Essays I wrote about town center parking can be found here, here, and here. Parking shall be more efficiently provided by generously allowing the sharing of parking, fee-in-lieu parking, leased parking (public ownership of parking). An essay I wrote about providing more efficient parking can be found here. 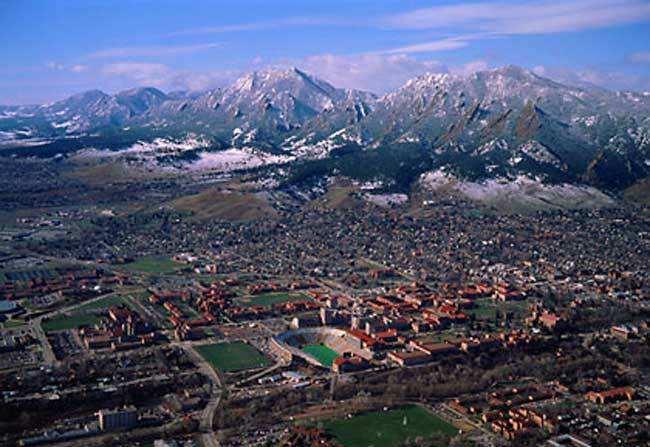 Work with CU to reduce Single-Occupant Vehicle travel by faculty, staff, students, in part by increasing the cost of campus parking, and reducing the number of on-campus parking spaces. Make dangerous wrong-way travel more likely. An essay I wrote about the impacts of one-way streets can be found here. Install more roundabouts and traffic circles to slow down traffic, make motorists more attentive, improve residential quality of life, and reduce intersection crashes. Install raised, landscaped medians where continuous left-turn lanes are found in the Boulder town center, such as Pearl Street, Broadway (Meadow to US 36), and Arapahoe Ave (turn pockets/raised medians). Doing this will dramatically improve pedestrian safety and comfort, reduce excessive car speeds, reduce inattentive driving, create a more human scale on Boulder streets that are excessively wide, and substantially improve the visual quality of streets. Humanize Canyon (20K ADT) and Broadway in the Boulder town center by putting them both on a diet. The rule-of-thumb threshold for relatively easy road diets are for streets that carry up to 25,000 average daily trips (ADT). An essay I wrote about the unintended consequences of Boulder seeking to reduce congestion, and recommendations about humanizing such streets as Canyon and Broadway, can be found here. Within city limits, five lanes shall be the maximum size of streets, and no more than one turn lane shall be installed at an intersection. In the town center, the maximum shall be 3 lanes. Do not create double-left turn lanes, and remove double-left turns now in existence. An essay I wrote about the folly of double-left turn lanes can be found here. While synchronizing traffic signals is discouraged, when such a measure is unavoidable in the Boulder Town Center, signals shall be timed for the speed of buses and bicyclists. Signals on Spruce and 13th in the Town Center are timed for cars and are very difficult to reach at cyclist speeds. An essay I wrote about problems associated with traffic light synchronization can be found here. Each year, there shall be a reduction in the amount of road space allocated to motor vehicles. Seek road diet opportunities (partly to save money in creating bike/pedestrian/transit facilities). Moratorium: No expansion of road space for car travel (via the addition of travel lanes, turn lanes, etc.) shall occur in the Boulder town center. Continuous left-turn lanes within the Boulder town center shall be retrofitted to install raised medians. The Transportation Master Plan contains an objective that states that “No more than 20 percent of roads shall congested.” This is counterproductive. It induces low-value car trips, more car travel, more air emissions, and more sprawl. More people bicycling, walking and using transit will NOT reduce congestion (due to gigantism, unpriced roads/parking and latent/induced demand). Contray to conventional wisdom, the “free-flowing” traffic sought after by this objective does NOT reduce air emissions and fuel consumption. On the contrary, because conventional tactics such as free roads/parking, synchronized signal lights, an excessive number of travel lanes (roads that are too wide) induce “low-value” car trips (trips on major roads to, say, buy a cup of coffee at rush hour), air emissions and fuel consumption INCREASE on a community-wide basis. An essay I wrote about the counterproductive aspects of seeking to reduce traffic congestion can be found here and here. Revise the definition of Complete Streets. The definition Boulder currently uses allows the City to make the bizarre claim that Broadway is a “model” Complete Street. The definition states that if there are bicycle facilities within a quarter mile parallel to the street, the street can be considered “Complete.” This definition gives a false impression that Broadway is “complete” and therefore needs no modification (such as a road diet) to be Complete. The creation of Complete Streets does not necessarily require the expenditure of money to build facilities or buy right-of-way. Often, a street can be made more Complete by simply allocating the ROW space differently, so that less space is allocated to cars and more space to bikes, pedestrians, or transit. Boulder should require that service vehicles be kept relatively small in size so that large vehicles don’t drive the creation of excessively large street dimensions. Boulder must emphasize accessibility when streets (and parking) are designed, NOT mobility. Mobility privileges car travel and discourages bicycling, walking and transit. Accessibility promotes transportation choices. A report I prepared which compares mobility to accessibility can be found here. Boulder needs to implement traffic calming on a large number of streets, as a huge percentage of streets are overly wide and induce excessive, inattentive, dangerous speeds. An essay I wrote about the merits of traffic calming can be found here. An essay I wrote dispelling the myth that calming increases air pollution can be found here. The Transportation Master Plan should list street segments needing Complete Streets or Road Diet treatments. The City should prepare a citywide road diet plan (examples of low-hanging fruit includes the conversion of continuous left-turn lanes to turn pockets). See “Humanize Canyon (20K ADT) and Broadway” above. Currently in Boulder, bicyclists, pedestrians and transit users pay unfairly high prices to travel, and motorists pay much less than their fair share of the costs of their travel. The following reforms would promote much more cost fairness for traveling in Boulder. To increase transportation funding equity and diversify funding, establish one or more of the following: a VMT fee, priced roads (an essay I wrote about tolling Rt 36 in the Boulder/Denver region can be found here), pay-at-the-pump car insurance, and other user fees. If possible, make such new taxes/fees revenue neutral by reducing or eliminating other fees/taxes when the new user fee is instituted. A detailed analysis of these sorts of user fees can be found here and here. Free parking for retail or services shops in Boulder is not “free.” Those “free” spaces, which are provided only for the benefit of motorists, are not truly free because they are indirectly paid by shoppers who buy products and services within the shops at an artificially elevated price that allows the business or property owners to pay for the purchase and maintenance of the parking. This hidden cost is passed on to ALL shoppers, even those who arrive by walking, bicycling or transit. This is clearly unfair, since such non-motorist shoppers are not using the car parking. Motorists are therefore unfairly subsidized, and non-motorists are unfairly punished financially. The City needs to enact policies that eliminate this pricing unfairness. Tactics include such things as unbundling parking, parking cash-out for employees, eliminating minimum parking requirements for the shop, reforming property taxes that financially penalize shop/property owners who replace parking with buildings, and requiring that parking for the shop be priced. Town center properties should have lower transportation fees assessed by the City, since their location and compact, mixed-use design reduces car trips. Doing that thereby reduces the transportation cost impacts of these properties compared to “drivable,” outlying properties. It is therefore unfair to assess town center properties the same fees as areas with higher levels of costly motor vehicle travel. Transportation Demand Management (TDM) strategies need to place more emphasis on sticks such as user fees and less emphasis on carrots such as bike lanes/parking. Many of the above recommendations promote more bicycle transportation. The following are additional suggestions. A huge number of citizens are “interested but concerned” about bicycling. They are interested in bicycling, but too concerned about safety to want to bicycle regularly. The city needs to remove (grind to smooth) raised “lips” at driveway ramps throughout the city – particularly in the town center. Such lips can be extremely dangerous for less-skilled or inattentive bicyclists. An inventory I conducted of locations where this corrective measure is needed can be found here. Traffic calming (designing streets to obligate motorists to drive more slowly and attentively) is rarely employed in Boulder, and a enormous number of streets can benefit from such a treatment. Doing so would dramatically induce citizens to bicycle more often, as high/inattentive car travel is an important reason why “interested but concerned” citizens opt not to be bicycle commuters (see links above). Road diets are a powerful way to promote bicycling, as they add more space for cycling, and reduce speeding and inattentive driving by motorists. Reduce the excessive promotion or requirement that bike helmets be worn at all times. While helmets tend to be important when riding on higher speed suburban and rural roads, as well as on unpaved mountain bike trails, they tend to be unnecessary and counterproductive on low-speed streets. An essay I wrote about the unintended consequences of the tendency to obsessively call for (or require) helmet use can be found here. The City should oppose any efforts at the state level to make bicycle helmets mandatory. Studies from around the world regularly show that mandatory helmet laws reduce per capita bicycling and do little if anything to improve bicycle safety – particularly in neighborhoods or town centers. Repeal the Boulder law that prohibits bicycling on sidewalks of commercial streets. Canyon and Broadway are WAY too hostile to allow bicycling on street. See link to the BoulderBlueLine below. As is done statewide in Idaho, allow bicyclists to treat stop signs to yield signs and red lights as stop signs. The vast majority of bicyclists already do this, and do it quite safely. An article describing, in detail, the merits of this approach can be found here. “Protected bike lanes” have important drawbacks, despite their popularity with many people who strongly promote them. (1) Such lanes induce higher speed car travel (when a “painted buffer” is used to separate bicyclists from cars); (2) Such lanes lower the ability to see the cyclist (when the protected lane is created by parked cars on the left of the lane); (3) Such lanes increase the inconvenience of bicycling, because bicyclists often have a more difficult time making left turns (this directly violates the need to make bicycling more advantageous); (4) Such lanes increase the difficulty to maintain a bicycling surface that is clear of glass and other debris; and (5) It is only affordable to create such lanes on a tiny fraction of Boulder street mileage, which makes the treatment nearly useless for bicycle commuters. Boulder’s town center is a surprisingly and inappropriately difficult place to ride a bicycle. There are a number of ways to correct this problem. An essay I wrote about how to do this in Boulder can be found here. Many of the above recommendations promote more walking and transit ridership. The following are additional suggestions. Boulder needs much more compact, mixed and dense development patterns to make transit and walking a substantially more desirable form of travel. These patterns need to be clearly, prominently called for by the Transportation Master Plan. Parking cash-out should be made available for a higher percentage of employees working within city limits. The quantity of “free” parking within city limits must be substantially reduced by pricing a much larger percentage of parking. Add real-time information at bus stops that indicate the time before the next bus arrives. Boulder should continue to require “cross-access” at mid-block locations so that pedestrians have shorter walking distances. Some of my thoughts about increasing bus ridership can be found here. Each TAB member should submit their list of top 10 or 20 transportation issues. Doing this would alert staff and elected officials about the priorities of this citizen board (and possibly inform staff and officials of issues they are unaware of), and better enable board members to collaborate with other boards (there is an admirable effort by the City to have board members collaborate with members of other boards, so that boards are more aware of what various other boards seek). By not knowing the priorities of other TAB members, TAB members are less able to convey to other boards anything about the priorities of TAB. Amend TAB by-laws to allow TAB members to discuss urban design and land use. Not allowing TAB to discuss urban design or land use for particular development proposals is extremely unwise, as urban design and land use are integral to achieving transportation objectives. Without conducive land use and urban design, such transportation objectives are extremely unlikely. Clarify whether TAB is reactionary or proactive. Is the role of TAB to simply react to development projects or issues brought to them by staff? Or are there benefits to having TAB members raise issues not brought before them? (issues that staff or officials may be unaware of). TAB members should maintain a standing legislative agenda (issues that TAB believes should be promoted at the state level by Boulder. This is important in part because there may be state-level issues that TAB is aware of that staff or elected officials are not aware of. Designate “walkable/compact” and “drivable” zones in city so we can apply “walkable” policies fairly and appropriately. For example, features such as the ECO bus pass, reduced setbacks, and mixed use land use patterns tend to be primarily appropriate only in the zones designated by the City as “walkable.” Such tactics tend to be less appropriate in the more “drivable” outlying zones of the city. More details about such “transect” zones can be found here. Some of my own thoughts about such zoning can be found here. Increase the amount of affordable housing by creating land use patterns which reduce the number of cars a household must own. Such tactics, which are mostly prohibited in Boulder, include allowing Accessory Dwelling Units, and mixing residences with relatively small, low-impact retail, services and jobs. Some of my more detailed recommendations for creating affordable housing can be found here. Create more housing and mixed use in Boulder town centers. Currently, Boulder provides far too little compact, walkable housing options in comparison to a demand which is far larger and growing (particularly because the “Millennial” generation seeks walkable housing at much higher levels than older generations). Hire Donald Shoup and Todd Litman to speak/consult in Boulder. Adopt an unbiased and plain English Stylebook. Use “Plain English” for plans, regulations, and presentations. Remove bias in transportation terminology. My detailed recommendations for doing this can be found here. Work with Colorado University to reduce SOV travel by faculty, staff, students. Tactics: disallow ownership of cars by freshmen, and increase the amount of on-campus housing. To kick off these reforms and increase citizen awareness of (and support for) helpful transportation tactics, I believe it is important, early on, to hold a transportation speaker series. Boulder has failed to learn Fred Kent’s essential lesson. That “[i]f you plan cities for cars and traffic, you get cars and traffic. If you plan for people and places, you get people and places.” Instead, the City counterproductively continues to strive to make cars happy by, for example, synchronizing traffic signals, keeping densities in central areas and major corridors too low, building and retaining overly wide roadways and intersections, and requiring excessive amounts of underpriced parking. Boulder has made the ruinous mistake of thinking that happy cars promote quality of life and reduces air emissions. But happy cars are the enemy of a quality city, and actually INCREASE air emissions. It is no coincidence, for example, that the places in Boulder where cars are happiest — the huge asphalt parking lots and the overly wide monster highways — are the places where people feel most exposed, most uncomfortable, most in danger, and least willing to linger or hang out. They are car places, not people places. They have obliterated what makes Boulder Boulder. This misguided path means that Boulder is, ironically, losing its ability to improve and protect its quality of life — its “small town” ambience, This road to ruin also means that achieving a community design which makes walking, riding a bicycle, or using transit practical for the vast majority of citizens is not at all possible. In Boulder, despite many achievements, it remains extremely DIS-advantageous to walk, bicycle or use transit. A great many of the recommendations above, if employed, are essential ways to reverse this. Mr. Nozzi has a BA in environmental science from SUNY Plattsburgh and an MS in town and transportation planning from Florida State University. For 20 years, he served as a senior planner for Gainesville FL and was briefly the growth rate control planner for Boulder CO. Today, he maintains a consulting practice in which he writes and speaks about street design, urban design, and quality of life. His primary skills are in urban design (particularly walkable streets and form-based codes), bicycle planning, transportation choice, “plain English” land development codes promoting quality of life, and comprehensive planning. He serves as a Complete Streets instructor for communities throughout the nation. He has been a member of the Congress for the New Urbanism. He wrote several environmental, transportation and urban design plans & regulations for Gainesville. He is in Who’s Who for the South & Southwest. His most recent book is The Car is the Enemy of the City. His second book, Road to Ruin: An Introduction to Sprawl and How to Cure It, was published in 2003. He has been an adjunct professor for the University of Colorado at Boulder, and currently serves on the Boulder Transportation Advisory Board and the PLAN-Boulder County Board of Directors. The views expressed in this article are those of the author and do not necessarily reflect the position or policy of other organizations or boards. Forbes, Gerald (1998). Vital Signs: Circulation in the Heart of the City—An Overview of Downtown Traffic. ITE Journal, August 1998. Goddard, S.B. (1994). Getting There. The University of Chicago Press, Chicago, pg. 68. Levinson, D., and Kumar, A. (1995). Activity, travel, and the allocation of time. APA Journal. 61 (4): 458-470. American Planning Association, Chicago. Autumn, pp. 458–70. Manning, I. (1978). The Journey to Work. Sydney: Allen and Unwin. Neff, J. W. (1996). Substitution Rates Between Transit and Automobile Travel. Presented at the Association of American Geographers Annual Meeting, Charlotte, N.C., April 1996. Newman, P., and Kenworthy, J. (1989). Cities and Automobile Dependence: An international sourcebook. Gower, Aldershot, England, p. 106. Stokes, G. (1994). Travel Time Budgets and Their Relevance for Forecasting the Future Amount of Travel. In Transport Planning Methods: PTRC European Transport Forum Proceedings. University of Warwick, pp. 25-36. Szalai, A. (Ed.) (1972). The Use of Time: Daily Activities of Urban and Suburban Populations in Twelve Countries. Mouton, The Hague. Zahavi, Y., and Ryan, J.M. (1980). Stability of Travel Components Over Time. Transportation Research Record. 750: 19-26. Cassady, Alison; Tony Dutzik and Emily Figdor (2004). More Highways, More Pollution: Road Building and Air Pollution in America’s Cities, U.S. PIRG Education Fund (www.uspirg.org). Hymel, K. M., Kenneth A. Small and Kurt Van Dender (2010). Induced Demand And Rebound Effects In Road Transport, Transportation Research B (www.elsevier.com/locate/trb). ICF Consulting (2005). Handbook on Integrating Land Use Considerations Into Transportation Projects to Address Induced Growth, prepared for AASHTO Standing Committee on the Environment. Available at: www.trb.org/NotesDocs/25-25(3)_FR.pdf. Litman, T. (2001). Generated Traffic; Implications for Transport Planning, ITE Journal, Vol. 71, No. 4, Institute of Transportation Engineers (www.ite.org), April, 2001, pp. 38-47. Available at: www.vtpi.org/gentraf.pdf. Litman, T. (2010). Changing Vehicle Travel Price Sensitivities: The Rebounding Rebound Effect, VTPI (www.vtpi.org); atwww.vtpi.org/VMT_Elasticities.pdf. Noland, R. B. and Lewison L. Lem (2002). A Review of the Evidence for Induced Travel and Changes in Transportation and Environmental Policy in the US and the UK, Transportation Research D, Vol. 7, No. 1 (www.elsevier.com/locate/trd), January, pp. 1-26. Model, Urban Studies, Vol. 34, No. 4, pp. 679-692. TRISP (2005). Treatment of Induced Traffic, Economic Evaluation Notes, UK Department for International Development and the World Bank (www.worldbank.org). Available at: http://go.worldbank.org/ME49C4XOH0. Summarizes transport project evaluation methods suitable for developing country applications. UKERC (2007). ‘Rebound Effects’ Threaten Success of UK Climate Policy, UK Energy Research Centre (www.ukerc.ac.uk); at www.ukerc.ac.uk/MediaCentre/UKERCPressReleases/Releases2007/0710ReboundEffects.aspx. UKERC (2009). What Policies Are Effective At Reducing Carbon Emissions From Surface Passenger Transport? UK Energy Research Centre; at www.ukerc.ac.uk/ResearchProgrammes/TechnologyandPolicyAssessment/0904TransportReport.aspx. Brovitz, Ted (2000). Converting Downtown Streets from One-Way to Two-Way Yields Positive Results. The Urban Transportation Monitor. Chiu, Yi-Chang, Xuesong Zhou, and Jessica Hernandez (2007). Evaluating Urban Downtown One-Way to Two-Way Street Conversion using Multiple Resolution Simulation and Assignment Approach. Journal of Urban Planning and Development 133, no. 4 (2007): 222. Ecologically Sustainable Design Pty Ltd (2005). Summary Report on the Conversion of One-Way Streets to Two-Way Streets in North American Town Centres. Victoria, Australia: Prepared for the Midland Redevelopment Authority. Available by request through Ecologically Sustainable Design Pty Ltd.
Walker, G. Wade, Walter M. Kulash, and Brian T. McHugh (1999). Downtown Streets: Are we Strangling Ourselves on One-Way Networks? Delucchi, M. (Inst. of Transportation Studies, UC Davis, CA 95616) (1996). A Total Cost of Motor-Vehicle Use. Access, Spring 1996. Ketcham, B. & C. Komanoff (1992). Win-Win Transportation: A No-Losers Approach To Financing Transport in New York City and the Region. KEA, 270 Lafayette #400, New York 10012; July 1992. Litman, T. (1998). Transportation Cost Analysis; Techniques, Estimates and Implications. Victoria Transport Policy Institute, 1250 Rudlin Street, Victoria, BC, V8V 3R7, Canada. Litman, T. & E. Doherty (2009). Transportation Cost and Benefit Analysis Techniques, Estimates and Implications. VTPI. MacKenzie, J., R. Dower & D. Chen (1992). The Going Rate: What It Really Costs To Drive. World Resources Institute, 1709 New York Ave NW, Washington DC 20006; June 1992. Miller, P. & J. Moffet (1993). The Price of Mobility. Natural Resources Defense Council, 71 Stevenson l #1825, San Francisco CA 94105, 415-777-0220; Oct 1993. Office of Technology Assessment (1994). Saving Energy in U.S. Transportation. U.S. Congress, OTA-ETI-589. Shoup, Donald (2005). The High Cost of Free Parking. Planners Press/American Planning Association. This is a great summary of the tools available to make our cities and towns more people-friendly places. We have been catering to the car for far too long in the design of our cities and this article shows us how to take it back and make improvements for people. Not that it’s going to be easy, but it is possible, and important to start the process. Thank you for your kind note, Paul. maybe this will be the future in urban traffice / space, what do you think ?